If you have ever been to Costco in the spring or summer time, than you have probably seen their paddle board packages as you enter the store. The one in question that I always saw at the stores was the Wavestorm SUP package. The main question I always wanted to know was are they really any good considering they are only $399 or sometimes less….Let me give you my personal discovery as I went and bought one a year ago. 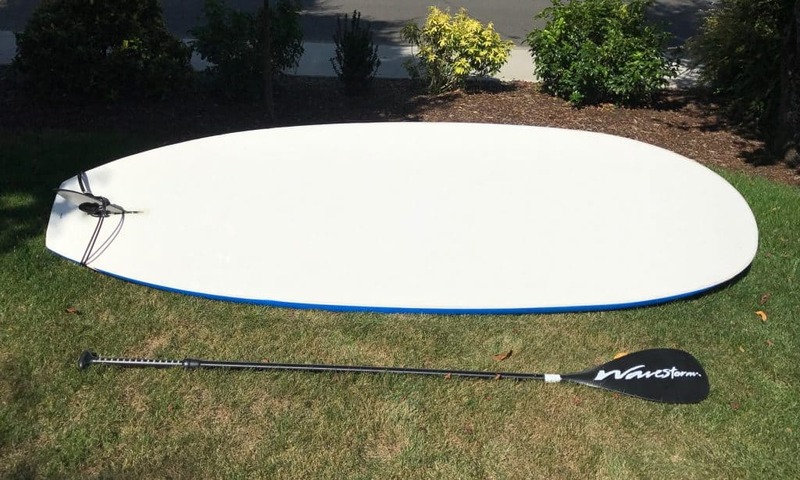 I had first noticed that my best friend had already purchased a new Costco paddleboard (Costco SUP) so I asked him if I could borrow it to see if it was worth purchasing. Right away I liked the fact that it was fairly light and soft so it was easy to pack around and durable if it got hit by anything VS a fiberglass board that I would be concerned about dinging. 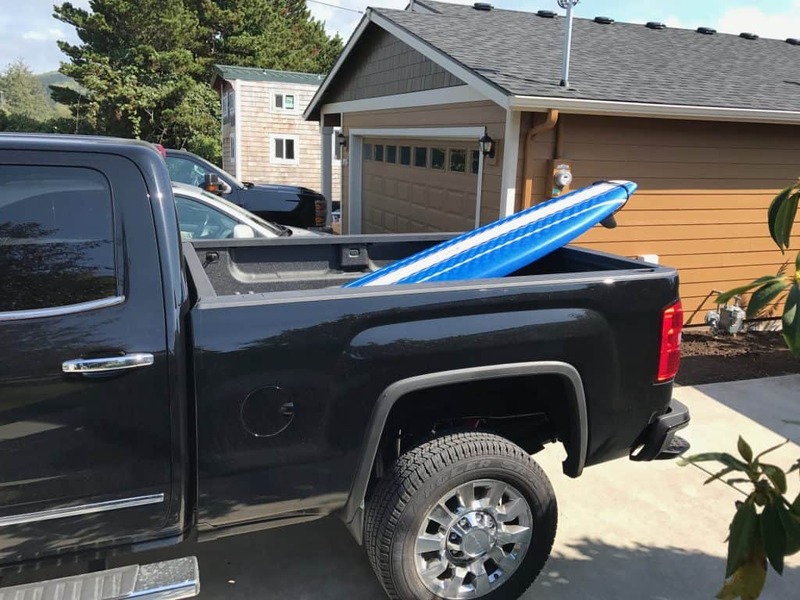 For starters, I have a short box pickup truck and it fit nicely (being that it is only 9’6″) in the bed of my truck. I then took it out to our local lake and jumped right on. It wasn’t to hard to stay balanced as the board has really good buoyancy and is fairly wide. You would really have to lean from one side to the other to fall off. The deck of the board was softer then a lot of boards and very nice on my feet as I went out barefoot. I still had plenty of traction as well. When paddling I will say that the board does feel a little sluggish. I would say that it has more friction than a fiberglass board would so if you are looking for a fast gliding board this probably isn’t for you. Let us keep in mind that this is a $400 board and not a $800-1,200 performance board so it is hard to be really critical. The large fin seemed to help it track fairly straight and I was able to go where I wanted when I wanted to. The paddle is nothing fancy but easy to use and easy to adjust as I am fairly tall so I had to lengthen it quite a bit which was no problem at all. After paddling around for a few hours I had enjoyed myself enough to realize that even though this didn’t wow me, it was more than worth the money for what you got. I proceeded to take the board back to my best friend and headed straight to Costco to buy my own. It was really a no brainer due to the price. With it being a solid board VS an inexpensive inflatable board, it didn’t blow around too much when the wind kicked up. It does come with everything you need: leash, paddle and board bag. This is nice to get all up front in one package. Unlike a lot of leashes, this one is comfortable. Great price for a SUP. Awesome for flat water enjoyment. Not a fan of the board bag as it is a pain to put on and take off. Color options are slim to none. Costco only seems to sell these seasonally which makes them harder to find locally. Not a super fast board as it is a little sluggish. All things said and done, for the money, this is a fantastic board if you are just starting out or you desire a basic board that anyone could borrow or use on a whim. You will not have to fret about anyone damaging it like a pricey fiberglass board and it is a great starter board for any individual. That being said, if you are planning to paddle around in the sea or open ocean, I would not recommend this board. I know it can be done, however, I would like a much longer, narrower board for the ocean, possibly a fiberglass board. Also, for surfing, I would certainly want something with a quicker response time that could turn hard and fast. This is a little on the slow side in regards to turning fast. This board is developed for open, calm water paddling for anyone that is a beginner to intermediate. For anything more than that, I would certainly go after a higher performance board that will typically cost a lot more. We have all type of reviews on other boards that are more performance based that you might want to check out. Looking For A Costco Paddle Board? You may not even be able to find this board anymore at Costco. Each year they change their line and brings in a whole new line of boards. This can get frustrating at times, but that is just how it is. We hope to keep up on this and bring you further SUP Board reviews on other boards as we get them and try them ourselves. Hi Francisoco, I do not have any of these in stock, but here is a link to buy them in a package deal for the best price I have found: http://amzn.to/2CN2Zr4 I hope this helps you out! 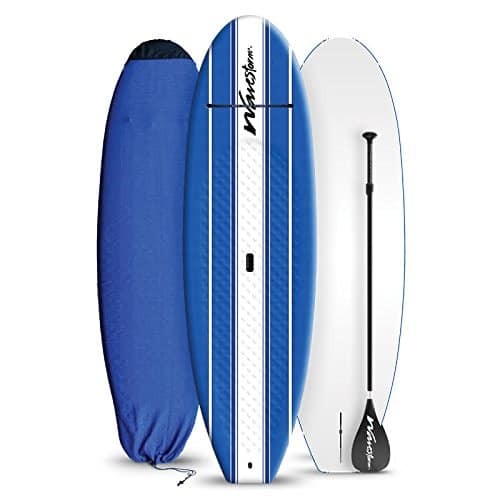 Our Costco Stand Up Paddle Board Review	Overall rating:	5	out of 5 based on 5	reviews.